(Alsace): He finds its origin in the north of the Elsas between Haguenau and Wissembourg. He is crossbreeded from the French and Hessian pouters. 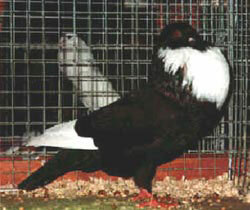 It's a big pigeon with a lenght of 40 till 45 cm. He is lightly erected. Overal impression is elegant.